Great Moulton, or Moulton St Michael as it is sometimes known to distinguish it from Norfolk's two other Moultons, neither of which is particularly nearby, is one of those parishes that straggles around lanes, clustering into groups of houses, with a pub, a shop, a hall and a couple of churches. You get the feeling you could live here without having to leave it very often. 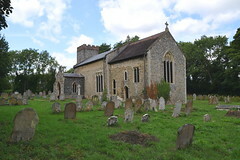 The village was also once home to one of the last surviving tin churches in East Anglia, Great Moulton Congregational. The building is now on display at the museum of East Anglian Life in Stowmarket. 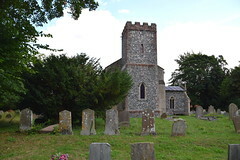 Its former near-neighbour, St Michael, sits fairly close to the Norwich to London railway line, which cuts through the middle of the village, which is itself only just off of the main A140 Ipswich to Norwich road. And yet, the church is secretive. You approach it up a narrow lane, and as the small graveyard opens up the little church presents itself to you, tower end first. Everything is small and to scale, and there is a crispness to the bright flint and red brick of the tower that is reminiscent of 19th century village churches on the south coast of England, or in the north of Ireland. 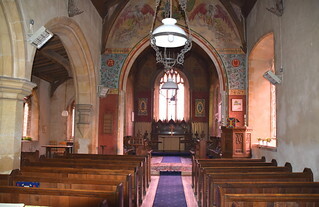 This is because the tower was completely rebuilt in the late 1880s, along with the north aisle. 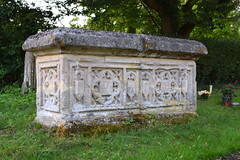 As you walk up to the church, there is an ancient tombchest in the churchyard beside the path. The panels cannot be any later than the early 16th century, which would make this one of the earliest graveyard memorials in East Anglia. However, the top does not match, and the panels almost certainly came from elsewhere, probably inside a church, and it is unlikely to have been this one. Most likely, they were reused for their current purpose in the 18th century. Continuing eastwards, you can look back at the church and see that the chancel is earlier than the nave, and is nearly as big. This is a juxtaposition that is repeated at several larger churches around here, including nearby Carleton Rode. Great Moulton is one of the Pilgrim Group of parishes, which are all very welcoming, and a pleasure to visit. However, one thing you'll notice immediately as you step through the door is quite how dark it is inside. I have been here on a bright day in late winter, the white light slanting across the graveyard, and on a day in high summer when the sky was cloudless, a fierce warm light filling the churchyard, but very little of it seems to get inside the church. This is largely because of the lack of windows in the western part of the nave. There is just one window in the south wall, at the east end. 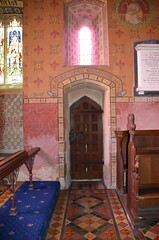 It is a truncated three-light 14th century one, which creates a pool of light before the chancel arch, but not much else. The small triple lancet east window of the chancel seems to punch a hole in the darkness rather than relieve it, but as we will see, the gloom is a special part of the atmosphere at Great Moulton. 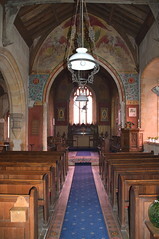 For as your eyes become accustomed to the light, you see that St Michael underwent a dramatic redecoration in the early years of the 20th century. 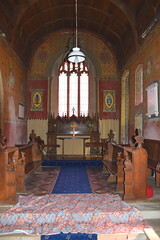 The walls are painted in pastel shades, and those in the chancel are stencilled with flowers, fleurs de lys and portraits of the four Evangelists. The window splays are full of intricate vinework, and scrolls containing Biblical quotations run along the walls. The scheme was topped off by a gorgeous large scale St Michael killing a dragon over the chancel arch, completed in 1909. Pevsner thought it was terrible, and you wouldn't want to find it in every church, but I am glad it has survived here. 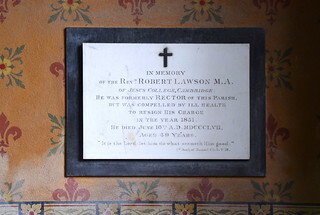 Once, many churches had late 19th and early 20th century stencilling - you can see something on a much larger scale nearby at North Tuddenham - but virtually all of them had their walls whitewashed in the 1950s and 1960s when this kind of decoration fell from favour. Their survival here gives St Michael a most pleasing atmosphere that cries out for the flickering of oil lamps and smoky candles. The walls are matched by floor tiling in the nave, which is less successful, or perhaps it is only more familiar. A south chancel window depicts St Michael and St George, in the typical martial poses of Clayton & Bell glass. A curiosity nearby is a Norman pillar, perhaps part of an old doorway. 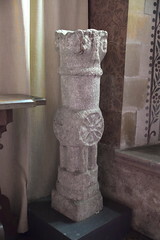 When Pevsner came this way he found it outside the church, but it has been rescued and brought into the sanctuary. Just as the darkness acts as a counterpoint to the decoration, so it must have suited the seriousness of the 17th and 18th century English Church. There are some fascinating survivals of those centuries at the west end of the church, high up in the darkness so that you probably won't even notice them unless you know they are there. 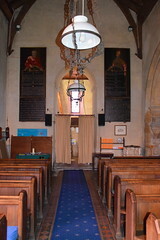 Firstly, either side of the tower arch are the two decalogue boards moved from the chancel by the Victorians. As is often the case with earlier sets, they include depictions of the two law-bringers, Moses and Aaron, one at the top of each board. Secondly, there are two sets of royal arms, one above the north door and one above the south. Neither has endured the passage of time without damage, but both are interesting. 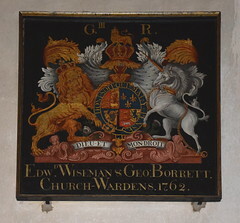 Those above the south door, on canvas, are to George III, and carry the names of churchwardens Edward Wiseman and George Borrett, and the date 1762. 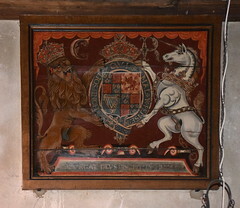 The set above the north door, painted on board, is not clear at all, but appears to be a rarer set to Charles I. I say appears, because although they have Charles's initials, they carry the motto Exurgat Deus Dissipentur Inimici, which was that of Charles's predecessor James I. There is an 18th century charity board in the north aisle, and it must be said that this aisle feels thoroughly rustic, without the urban patina so much Victorian work has. It could almost be medieval, if you didn't know. 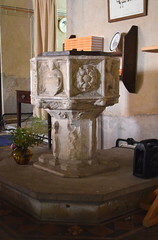 The font is a grand 15th century one with lions and fleurons on the bowl. The stem has been vandalised, and when Mortlock came this way the lions around the base had been replaced with plaster ones. But these are now gone. 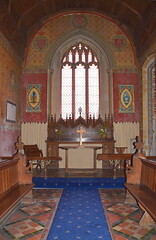 The oldest thing inside the church is actually the original 14th century chancel arch, which was not rebuilt. It has little heads at 30cm intervals. I wonder how many are portraits of parishioners of the time? 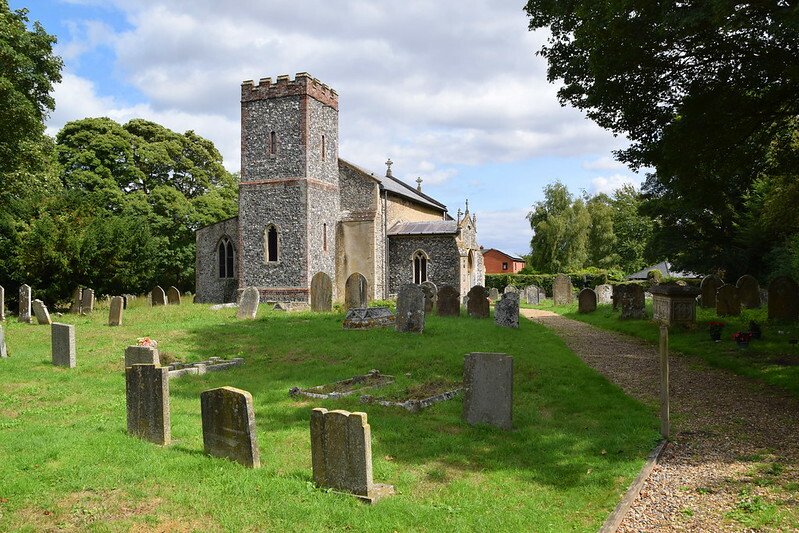 This is a lovely church, quite unlike any other in this part of Norfolk, with a special character and atmosphere all of its own.